A place to share Puglia travel stories and ideas, ask questions and get answers. Join us! In our travels to Puglia, sadly we’ve often seen evidence that people don’t care about the region’s precious heritage and antiquities. We’ve seen beaches and historic sites littered with trash. We’ve also seen graffiti on public buildings, but this is a first. 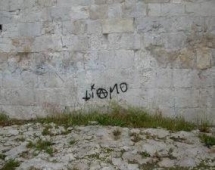 Someone has spray-painted “Ti amo” (“I love you”) on Castel del Monte. This is not just any building; Castel del Monte, built by Frederick II in the 13th century, is recognized internationally for its historic significance. It was designated a World Heritage Site by UNESCO in 1996. People from around the world visit each year to admire the construction and try to figure out the structure’s significance. It’s a disgrace and an embarrassment that someone would defile this site in such a way. Acknowledging Puglia’s importance among international travelers, the magazine reports, “Despite a late start in tourism, Puglia has jumped ahead of other regions in Italy with its abundance of stylish hotels, yet even in this high-design market, Borgo Egnazia stands out. Unlike many of its masserie (traditional Puglian farmhouses) counterparts, the hotel is newly built in the traditional style, a large compound surrounded by stone walled field of ancient olive trees. An enclosed courtyard leads into a lofty, domed hallway filled with hanging lanterns, while fireplaces set into the white stone flicker throughout the public spaces. The 63 comfortable guest rooms have white stone walls and canopy beds, and each comes with a terrace looking onto the sea, the hills, or two huge pools flanked by double-size daybeds. The spa has a heated indoor pool, and the 18-hole golf course next door, the San Domenico, is one of the area’s main attractions (this, combined with a terrific children’s club, is a welcome combination for families).” Doubles range from $587 to $677. You are currently browsing the Puglia Connection Blog blog archives for April, 2011.